« What’s flowering in early March? 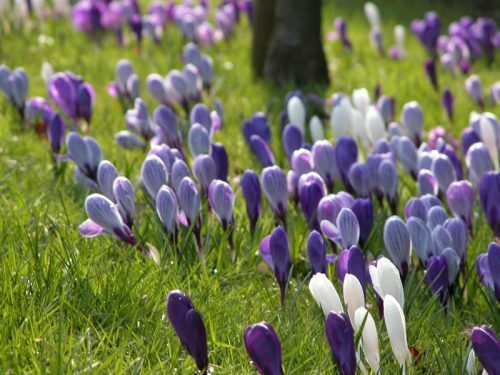 What’s the collective noun for a group of crocuses? A cluster, a crowd, a colony? A swathe, a dazzle, a drift? On a bright, chill-nipped, late-February afternoon in Cannizaro Park, the word which comes to mind is crescendo – the pale buds, pushing up in clumps through the crumpled dead leaves and winter mud-brown soil, gradually increasing in number and intensity of colour, spilling across the grassy borders, unfurling to reveal orange stamen and deep purple petals, peaking at the very moment I reach the park gates! Cannizaro Park is a 34-acre Grade II* listed English Heritage garden, to the south of Wimbledon Common. 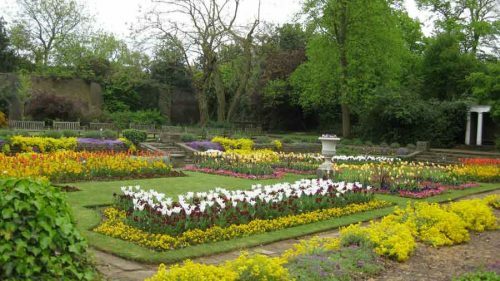 A private garden for 300 years, it was acquired by Wimbledon Borough Council, now London Borough of Merton, in 1948 and a short time after, opened to the public. The stately home it surrounds is now a hotel and the gardens provide the backdrop to many wedding reception photographs. 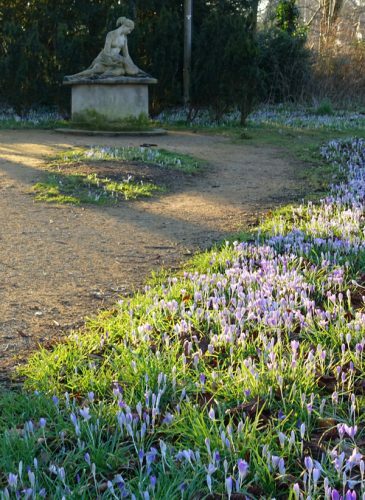 A little later, and it will be transformed by the mass of blossoms in the azalea dell and then the brightly coloured summer bedding in the formal Sunken Garden, but for now, the crocuses hold sway. The statue of Diana and the Fawn, originally from a Sicilian villa, can be found at the north-western tip of the park. 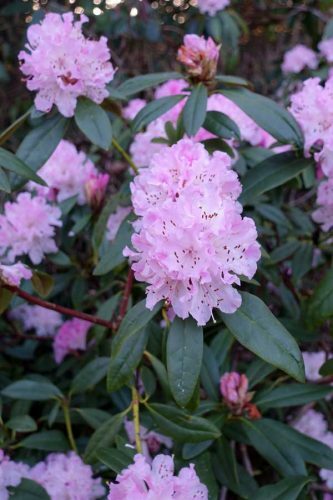 Lady Jane’s Wood is known for its collection of rhododendrons, azaleas and camellias. Here, only a few are flowering just yet but the plump buds hint at lots more to come. Walking through the dark azalea dell, with London’s emerald parakeets screeching overhead, it felt very much as if I was exploring a tropical rainforest! 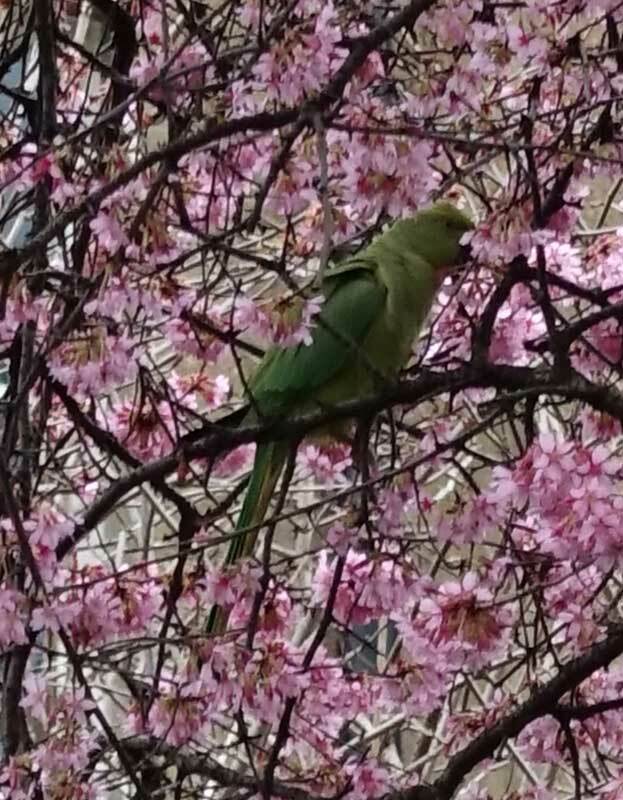 The next day, I had a close-up view of the ubiquitous exotic parakeet – this time in Margravine Cemetery. 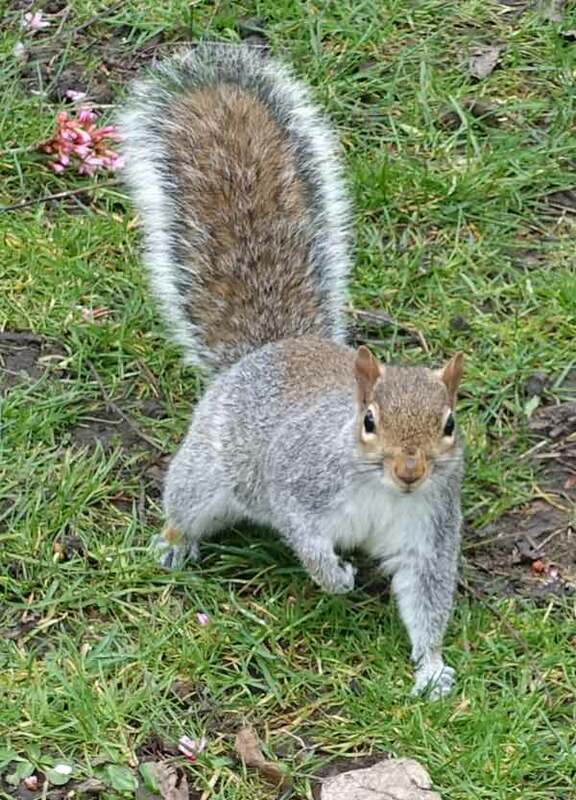 In fact, I felt a little like Francis of Assisi, surrounded as I was by curious and hungry squirrels and pigeons. 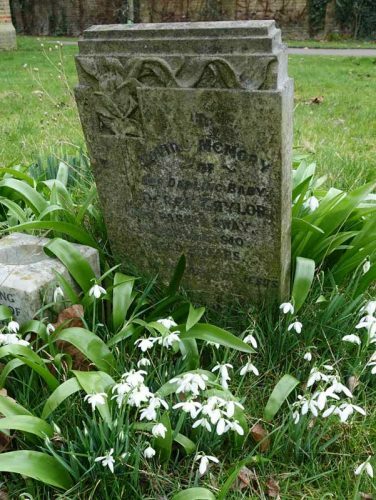 Margravine Cemetery is just around the corner from Barons Court tube station and forms part of the Barons Court Conservation area. 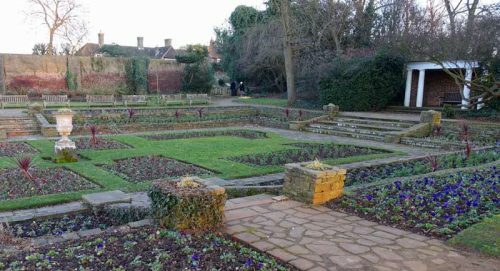 It was opened in 1869 in response to a shortage of burial plots caused by outbreaks of cholera, and became a Garden of Rest in 1951. Nowadays, it is a peaceful, atmospheric mix of wildflower-rich grassland and ancient gravestones. 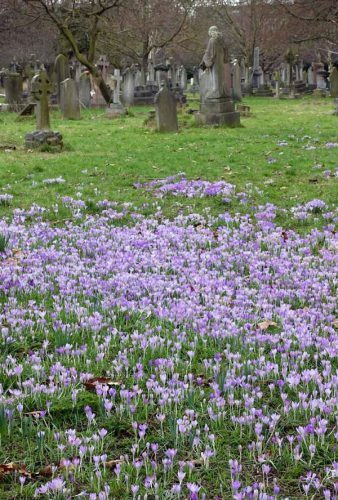 Like the Friends of Cannizaro Park, the Friends of Margravine Cemetery are a voluntary organisation dedicated to improving and supporting the gardens. 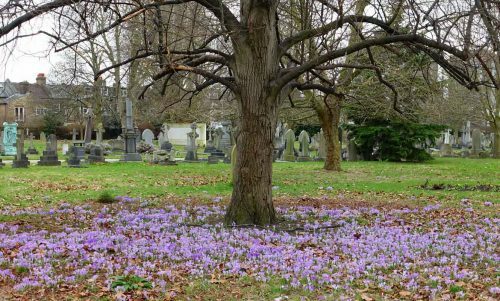 In 2016, they entered the Cemetery into the London in Bloom awards gaining ‘Outstanding’ in the ‘It’s Your Neighbourhood’ category, and a silver-gilt in the ‘Our Community’ award. It’s not surprising then that the crocuses are magnificent here as well. 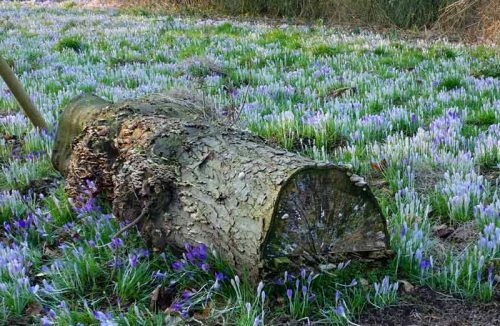 As the earlier-flowering snowdrops fade, the crocuses push up, pooling around tree trunks and lining the pathways with a sea of delicate purple. A cheerful, little cormous perennial, with linear, mid-green leaves, vertically striped silvery-green. 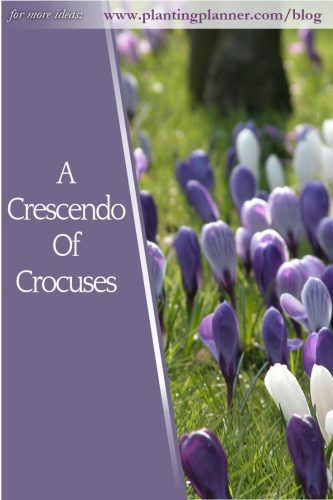 There are many species of crocus, together with a range of subspecies and cultivars, some of which flower in autumn. 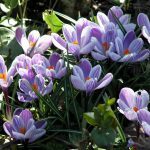 The large Dutch crocuses are the most commonly planted spring-flowering crocuses and come in whites, purples and yellows. 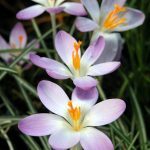 Good varieties for naturalising include stripy Crocus vernus ‘Pickwick’ and Crocus tommasinianus (‘Whitewell Purple’ has purple outer tepals, silvery lilac inside, with contrasting golden anthers). Crocus sieberi subsp. sublimis f. tricolor has fragrant, mauve flowers, which open to reveal a central egg-yolk yellow throat, surrounded by a white band, with a third outer band in mauve. Plant corms 8-10cm (3-4in) deep in autumn. Add grit to heavy soil to improve drainage. 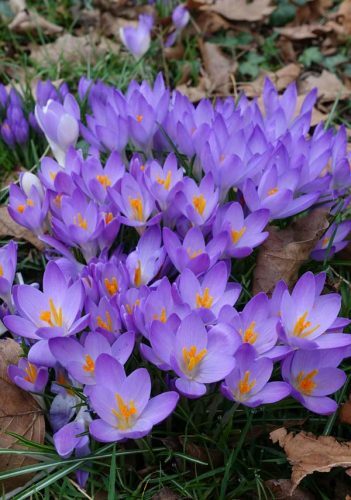 Crocuses likes well-drained soil in full sun. Allow the plant to set seed for an even more impressive show the following year. 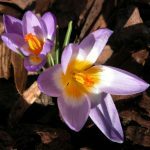 Crocus is a good early source of nectar and pollen for bees. For more gardening ideas, click here to follow the Weatherstaff PlantingPlanner on Pinterest.